Besides the regular music and text preparation needed to go into the first day of rehearsals for The Fairy Queen, I've been looking into the history of this opera. It's super interesting! Although Purcell's opera is based on Shakespeare's A Midsummer Night's Dream, Purcell never actually set a single line of Shakespeare's text. I've been examining both the original play and Purcell's interpretation to make informed discoveries on character choice and the grand theme of this piece. NUOVA has always had a reputation for being an amazing summer intensive for artists looking to strengthen their craft. In particular, I was incredibly excited for NUOVA's programs this year because of the stress placed on the development of acting skills. This year will focus more on physical awareness and artistry as singing actors. I believe this training will be invaluable as a young performer. Katherine Trussler is a first-year masters student at Western University studying with Jackie Short. The Manitoban soprano graduated with her Bachelor of Music from Brandon University. She represented Manitoba as their soprano for the National Youth Choir of Canada in 2016, had the honor of receiving the Rose Bowl for Voice in the 2017 Brandon Festival of the Arts, and in 2018 won Brandon University's Concerto Competition. 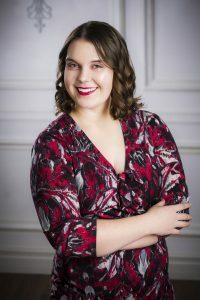 Katherine's previous opera experiences include Samantha from Gerald Muller's Chronicles: Vignettes of Passion, Marcellina in Aedo's 2018 production of Le Nozze di Figaro by Mozart, and chorus in Western University's 2019 production of Le Nozze di Figaro. She is excited to be playing Mystery in Opera NUOVA's 2019 production of Purcell's The Fairy Queen.